Home / Competitions / Have a nice weekend! Just a small post this afternoon - I hope everyone has a nice weekend! 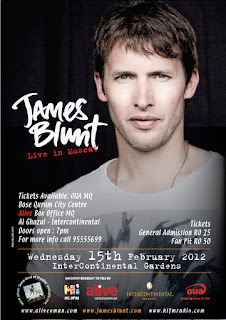 Don't forget that I'm giving away 2 VIP tickets to see James Blunt next month, I don't give out the emails to anyone (except the winner so they can be contacted by Hi FM) and never will share contacts with anyone. Click here for more information about the concert and how to enter for the tickets. There is the Mommy & Me exhibition today and tomorrow (9am-9pm) in MQ above Silk Route / HSBC / Subway if your interested in that stuff. Also, the Muscat Pirates rugby kids U6,U8,U10 and U12 teams are heading to Dubai this weekend to contend in a rugby tournament - so good luck to them too!